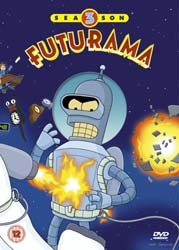 At last, Season Three of Futurama is available to own on DVD and video. This time out everyone's favourite delivery company of the future pays homage to a number of classic sci-fi movies including: Fantastic Voyage, The Day the Earth Stood Still and The Wizard of Oz. Roswell That Ends Well, is the obligatory "Look! We were responsible for the UFO crash-landing at Roswell" episode - which crops up all to frequently in sci-fi TV shows. There is also a great bit of 80s video game nostalgia in the episode Anthology of Interest, Part II. This is certainly an episode that will make most 30-somethings smile as Donkey Kong, Space Invaders and Mr and Mrs Pacman are wheeled out of retirement. Extras include the usual assortment of deleted scenes and audio commentaries as well as a "How to draw" segment that teaches budding artists how simple it is to draw Fry and Leela. There is also a hidden Easter Egg that offers alternative show opening quotes. This season also contains a number of snippets of popular music tracks including Simple Minds' Don't You Forget About Me and Roy Orbison's Pretty Woman, which helps to add poignant conclusions to several of the episodes.